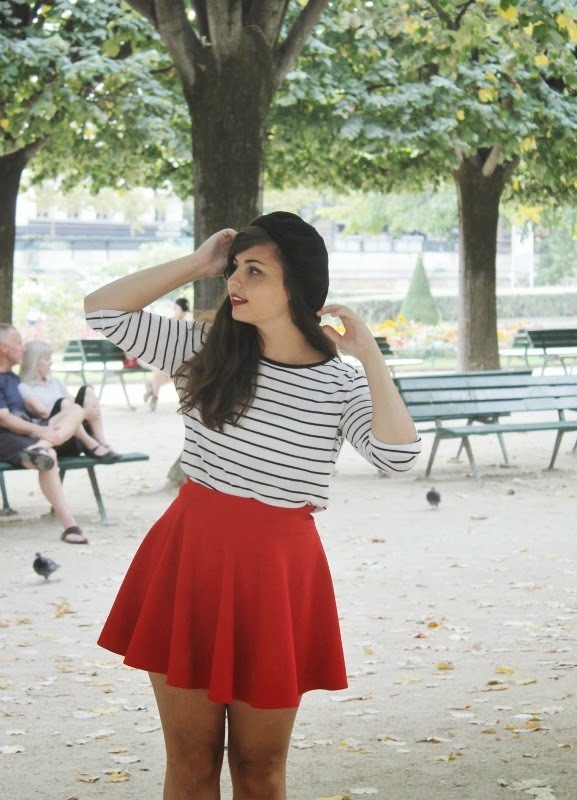 I had a chance to take some outfit pictures in a park by Notre Dame one day when we were in Paris and was wearing my best Parisian inspired outfit. 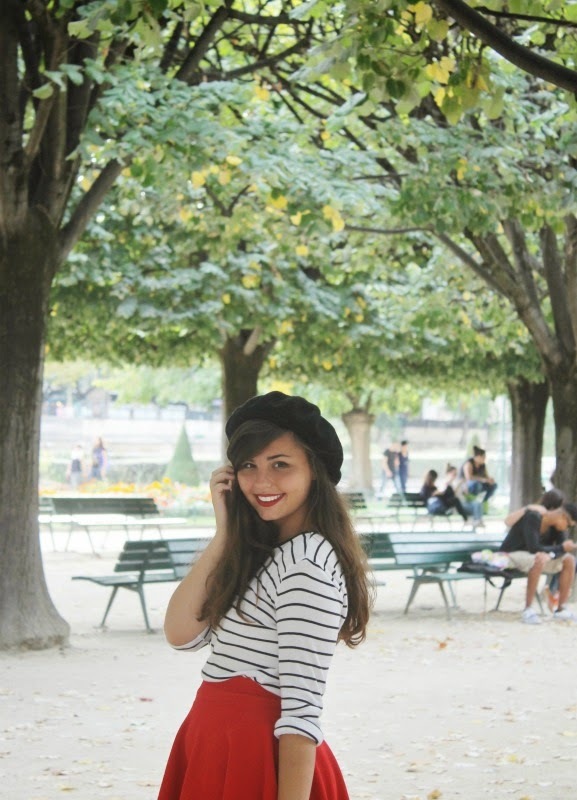 I know this isn't actually how people in Paris dress, but I like to pretend, ha. I actually did get mistaken as a French girl quite a few times by tourists-- had to disappoint them that I'm very American, lol! I do love the way Parisians dress though. I had to take quite a few street style photos for a school project and enjoyed snapping pictures of the different ways of dress. Just because I'm not familiar with it living in midwestern ohio, I loved the super high end glamazon women who were dressed in head to toe designer. It was unreal to see that these people actually exist and aren't just pins on pintrest. I loved examining them and studying them when they shopped (as weird as that sounds) but it was so interesting to get a look into shopping habits of the wealthy who just but whatever they want. I sat in Dior awhile and watched women casually try on thousands of dollars worth of dresses like they were at Forever21 and add a hand bag on just because. Something I've never experienced and was really intriguing to see this side of the industry. This is such a gorgeous outfit, I love dressing like this as well, it's such a chic style! Such a great Persian look!! You look so adorable, and very francais ;) It's great you are immersing yourself in that side of fashion - I can't imagine having that much disposable income! Brilliant!!!! 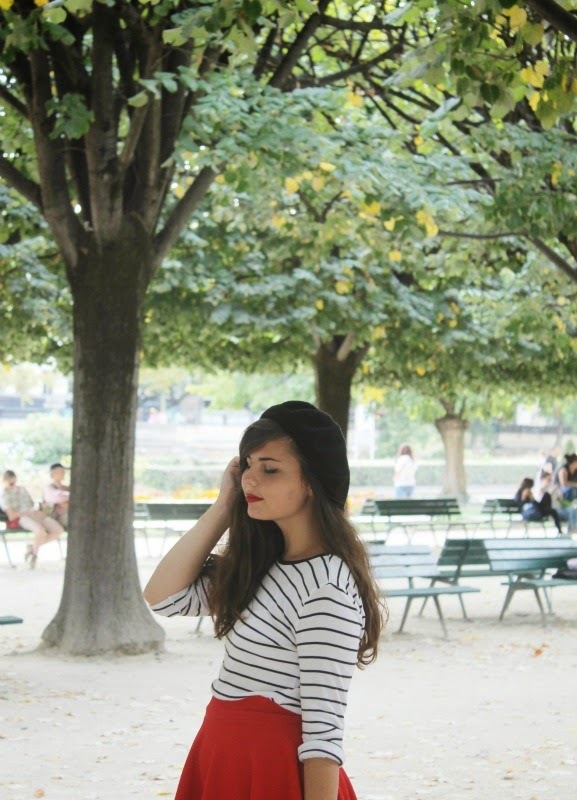 Breton stripes and beret in Paris- I love it! I work at Nordstrom so I encounter these women often. I also work in the most expensive shoes that the store carries, think Christian Loubitiins, Prada, Gucci shoes. So during work Ill often see women throw down a thousand or more on one pair of shoes like its nothing. Its insane to me! Would love to see you street style pictures! People watching must be one of the most exciting parts of visiting a new culture! I love the couple on the bench behind you too and wish I could know their story. Lovely outfit :) I love your blog and I have followed you with Bloglovin and GFC. If you ever get a chance to check out my blog I would be delighted, thanks! Cute outfit! French themed for the french city!